Boston…1868 Katie O’Neil reluctantly leaves Ireland and endures the journey to America in the hold of a steamship to join her Cousin Moira as a domestic (kitchen canary) for the Brennan family. Mr. Brennan violates the women, who hide their shame even from each other. When a crisis arises, they bond with other household help, freed slaves, and Mrs. Brennan to commit desperate acts. 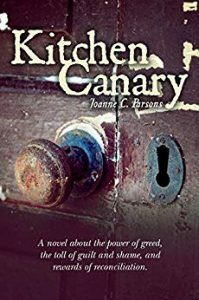 Kitchen Canary breathes life into the stories of our ancestors. It is heartbreaking and inspiring as immigrants and freed blacks struggle and sacrifice to establish a better life for their children. The period is rich in history as Irish break into politics, freed slaves migrate North, and women assert their rights. $0.99 on Kindle. Find more books like "Kitchen Canary" on kobovskindlereviews.com. We feature both reviews of ereaders and discounted + free books on Kindle. Browse more books in the Womens Fiction. Disclaimer: "Kitchen Canary" price was accurate on April 12th, 2019. However, Amazon Kindle book prices can and do change frequently and without notice. Before you buy a book on Kindle, it's best to double check the price. If you purchased a Kindle book that you thought was free, you can return it by following the Kindle book return instructions here.